MTM from Wettstetten will be represented at the Autosalon in Geneva from the 3. – 13. March 2011 with two cars. In hall 5 MTM, car manufacturer and upgrading specialist, presents not only technical details and masterstrokes but also a visual highlight, which lets the exhibition hall shine in the truest sense of the word. The MTM R8 Biturbo with 777 hp / 571 kW and a top speed of more than 350 km/h was highly polished by MTM , this unique specimen with a worth of over 400.000 € was depainted completely in a special procedure and the aluminium chassis was polished in more than 700 working hours – all handmade . As well to see at the Autosalon: the MTM TT RS in the MTM design with 472 hp / 347 kW, which reached a top speed of 312 km/h at first test drives in Nardo. The test drives on the highspeed track in Nardo in South Italy in September last year showed that the car can be moved in a sporty way also under extreme conditions, full load drives and extreme temperatures. MTM uses a coil over kit with adjustable suspensions, 20″ forged rims in the Bimoto design and MTM brakes 380 x 34 mm dimpled with 8-piston calipers at the front and rear axle. The V10 Biturbo engine was already tested successfully in the RS6 with up to 740 hp / 544 kW and a top speed of 362,5 km/h in Nardo. 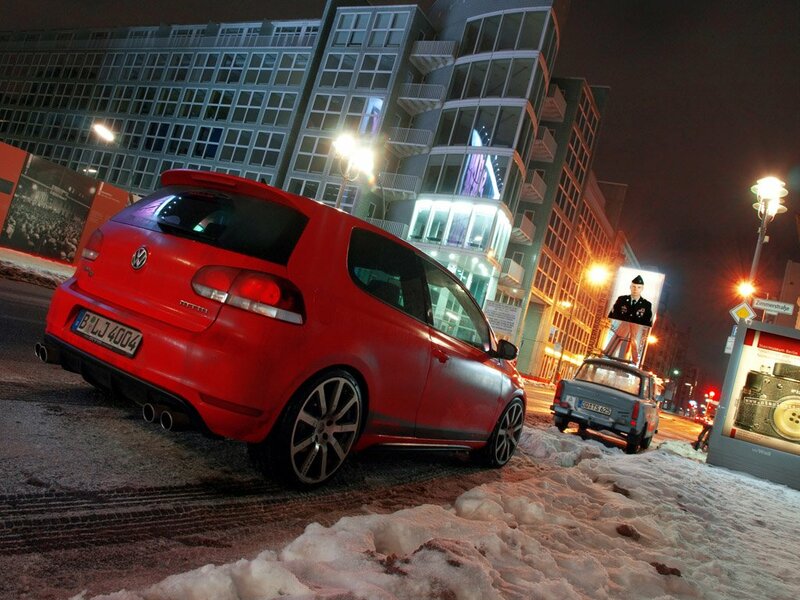 MTM Golf GTI/GTD Performance Options. The MTM tuning engineers have been working on some performance kits for the sixth generation Golf’s. Drivers of the sixth generation will be spoiled with MTM products, to increase the performance figures. Four complimented tuning stages, beginning with 270 hp (199 kW) through the remapping of the ECU using code developed on the Hockenheimring. In its latter stage of tune, MTM reaches more than 300 hp/ps through the modification of the ECU, MTM turbocharger with exhaust tubular manifold and complete 4 pipes exhaust system. The exact characteristics are 310 hp (228 kW) and a torque of 410 Nm, with a time of 1.16 min realized on the small track of Hockenheim, top speed of about 270 km/h and 5,7 seconds from 0 to 100. MTM provides the new GTI with 19″ sport rims in new BIMOTO 9-spoke-design which offer enough space for the MTM brake system with 380 mm discs. Last but not least, MTM advises the in-house suspension kit, which lowers the front about 30 mm. For the ones who are only searching ‘a little bit’ more, they are in good hands at MTM. The 60 hp upgrade compared to the series car and also the 18″ sport rims in the Bimoto Design – available since the beginning of 2010 – enable a first entry into MTM high quality tuning already available from 2800 euro incl. taxes. Mighty Diesel power. The Golf GTD by MTM. 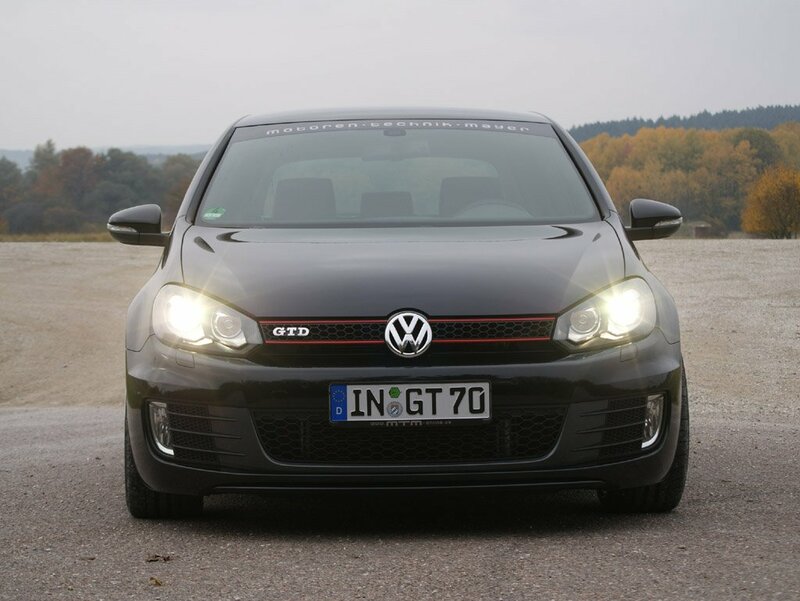 Also for all you Oil Burners MTM also have a power upgrade – through ECU modifications – of 205 hp (151 kW) and a torque of 380 Nm, the MTM Golf GTD is clearly ahead of the series GTD, with an acceleration from 0 to 100 km/h of 7,1 s instead of 7,8 s and a more direct torque curve. For those who are looking for more than a power upgrade, it’s also possible to revert to MTM’s full range of tuning products. Starting with the well-known MTM exhaust system in 4-pipe-optic and 80 mm diameter, over MTM suspensions, MTM sport rims in the BIMOTO design and MTM brake system, the Golf GTD can perfectly provided with. Nobody has to be afraid of the prices: 800 Euro (incl. taxes, excl. installation) for the power upgrade, 1.499 Euro for the 18″ rim set and for the ones who pay an additional charge of 400 Euro even gets a 19″ rim set.